LONDON--(BUSINESS WIRE)-- Market research firm Technavio has announced the release of their latest report on the global respiratory drugs market. This new report will provide expert market insights for the forecast period 2018-2022. The report will follow up on Technavio’s previous respiratory drugs research, providing an up-to-date analysis of the market regarding the current market scenario, latest trends and drivers, and the overall global environment. The report will also provide new predictions for the forecast period based on an in-depth analysis of the market. The upgraded research report on the global respiratory drugs market is an integral part of Technavio’s cardiovascular and metabolic disorders portfolio. Technavio covers an extensive range of market research reports on the cardiovascular and metabolic disorders market, focusing on the development of innovative compounds for novel targets. Some of the topics include biologic therapeutics, peptide therapeutics, liver cirrhosis therapeutics, and type 1 diabetes drugs. Technavio’s previous report on the global respiratory drugs market projected that the Americas was the leading market for respiratory drugs in 2015 and will continue to dominate the market through 2020. The high incidence of respiratory diseases in regions such as the US, Canada, and Latin America is expected to promote the growth of the market in this region. 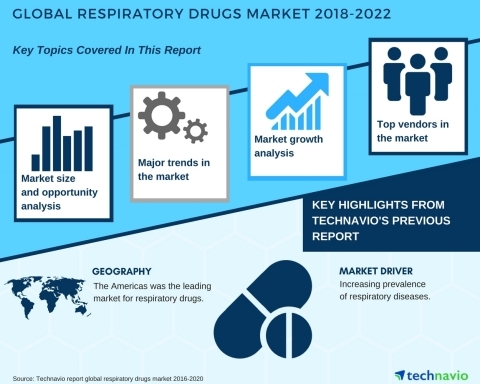 Technavio’s new report on the global respiratory drugs market will evaluate the key geographical regions and their behavior over the past four years, introducing new data and observations and providing new predictions. Technavio’s report on the global respiratory drugs market for the period 2018-2022 is available to order now and will be delivered within one week of purchase.